What am I doing wrong? Why was the connection refused? According to the instructions, it seems this is the correct command to install it. ps: I'm not that familiar with Linux, I'm more of a Windows guy, trying to learn Linux. Anbox has >=4GB RAM recommended hardware requirements. Please find updated installation instructions for Anbox (64-bit architecture only) at https://github.com/anbox/anbox/blob/master/docs/install.md. These will add the PPA to your system and install the anbox-modules-dkms package which contains the ashmem and binder kernel modules. They will be automatically rebuild everytime the kernel packages on your system update. After you installed the anbox-modules-dkms package you have to manually load the kernel modules. The next time your system starts they will be automatically loaded. IMPORTANT: THIS IS ALPHA LEVEL SOFTWARE. EXPECT INSTABILITY AND BUGS !!!!! I installed Anbox anyway in Ubuntu 17.04, and the built-in Android apps included in Anbox worked out of the box, although the expected bugs and instability arrived as promised. Reboot to finish the anbox installation. Type "anbox" in the Dash and click the Anbox icon to start the Anbox Application Manager. 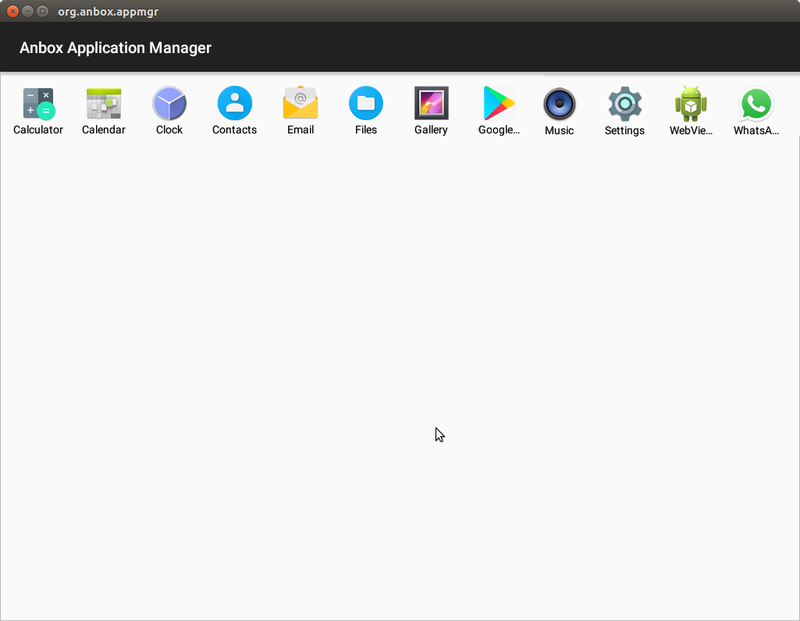 In the Anbox Application Manager you will see a row of application icons. Click on an icon to launch it. The Android application will launch in a new window and you will be able to run it. Downloading an .apk file from a warez website is a miserable security risk, however some applications allow you to download the .apk file from the application's official website, for example WhatsApp Messenger for Android. Then maybe the app will install or maybe it won't install if the app requires additional dependencies that are not installed in your operating system. For example WhatsApp requires Java as a dependency. I already have Java installed in Ubuntu 17.04 so I tried to install WhatsApp. I got an error message that said error: cannot connect to daemon. I closed Anbox and reopened it. I got another error message that said write: Broken pipe. I closed Anbox and opened it again and got the same error message. Anbox is buggy just like the anbox-installer script says it is. I closed Anbox and reopened it again and finally WhatsApp installed in Anbox. WhatsApp will send an SMS message to verify your phone number. WhatsApp also asks if you want to give the app permission to access the files on your device which is another security risk in my opinion. I think it's OK to give WhatsApp permission to access the files on my phone, but I don't want to give the app permission to access the files on my computer. Permissions are a matter of fundamental importance in Linux. You should be very careful about giving permissions to an application that it doesn't already have by default, and the telegram-latest snap package in Ubuntu 16.04 has better support than WhatsApp including Telegram Calls voice calls which are currently available to users around the world. Not the answer you're looking for? Browse other questions tagged software-installation snap anbox or ask your own question. How to install and run Anbox in Ubuntu 18.04? How can I prevent Anbox apps from accessing my files?